University of Texas Rio Grande Valley forward Terry Winn III (3) drives to the basket against North Dakota in a non n conference game at the UTRGV Fieldhouse on Wednesday, Dec 5, 2018, in Edinburg. EDINBURG — The UTRGV defense was unforgiving and unrelenting to the North Dakota Fighting Hawks. 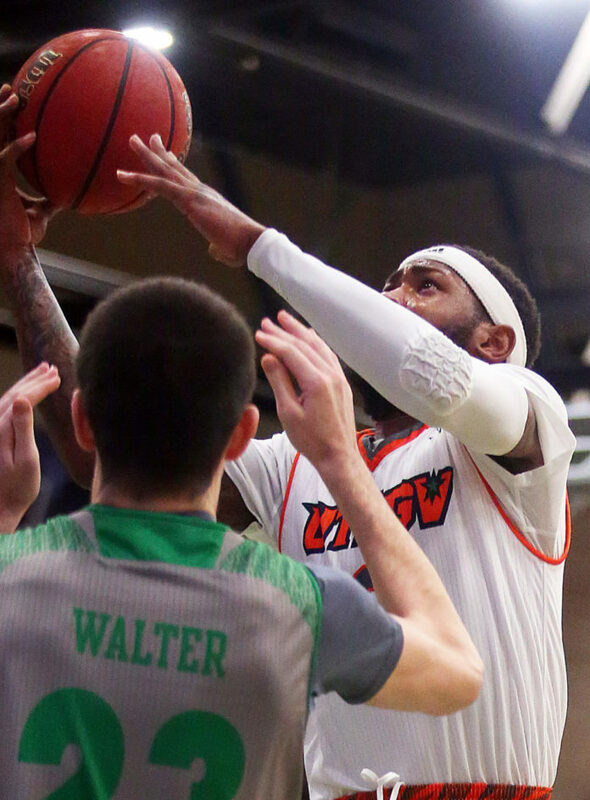 The Vaqueros forced the Fighting Hawks into 30 turnovers, including 23 of them in the first half as UTRGV ran past North Dakota 70-56 Wednesday at the UTRGV Fieldhouse. A week earlier at Houston, UTRGV faced a Cougar team that made 43.4 percent of their 3-pointers and forced them to shoot 6-for-23 (26 percent) from long range in a five-point loss. North Dakota (4-5) entered Wednesday shooting 38 percent from the 3-point line, but the Vaqueros held the Fighting Hawks to only 5 of 16 makes from 3-point range. Levi did a little bit of everything in victory. He led the team with 15 points, made two 3-pointers, hauled in six rebounds, had six steals and recorded three assists for UTRGV. Levi, UTRGV’s leader in minutes played, played a team-high 32 minutes, 24 seconds on Wednesday. “We condition pretty well in the offseason, so we’re all in pretty good shape,” Levi said. UTRGV had three other players score in double figures thanks to Jordan Jackson (13 points), Terry Winn III (12 points) and Greg Bowie II (10 points). Winn made four field goals in a game for the first time since UTRGV’s Nov. 19 game against East Carolina. He averaged 15.4 points through the first five games of the season, but scored no more than eight points in the five games leading into Wednesday night. UTRGV (7-4) started its four-game homestand with a win and also wrapped up the Summit League/WAC Challenge in favor of the Western Athletic Conference. All nine teams from the WAC and Summit League have met or will meet in nine nonconference games in the inaugural event. The WAC owns a 5-2 advantage over the Summit League.